Shares in fashion and jewellery retailer Lovisa Holdings (ASX: LOV) traded in a volatile manner after the company delivered its full-year result on Tuesday. This was somewhat surprising given that the group’s fiscal 2016 earnings before interest and tax of $24.2 million was in line with management’s guidance and slightly above the expectations of Bell Potter analyst, Sam Haddad ($24 million). Lovisa’s shares declined from the previous day’s close of $3.00 to hit an intraday low of $2.62 before recovering most of the lost ground to close at $2.91. Haddad highlighted there were a number of positive takeaways from the result and he maintained his buy recommendation, while marginally upgrading his earnings per share estimates for fiscal 2017 and increasing the share price target from $3.10 to $3.40. This implies a premium of 17% to yesterday’s closing price. However, the target price appears to be reasonably well supported by Haddad’s fiscal 2017 metrics which point to an underlying net profit of $19.6 million, representing earnings per share of 18.3 cents. The share price performances of LOV should not be used as a guide to future performance and any investment decision should not be based solely on this information. This would imply a PE multiple of approximately 18 relative to Haddad’s price target. Given he is forecasting LOV to generate earnings per share growth of circa 17% in fiscal 2017, the multiple appears appropriate. However, it should be noted that broker projections and are estimates that may or may not be met and investment decisions should not be based on these forecasts. 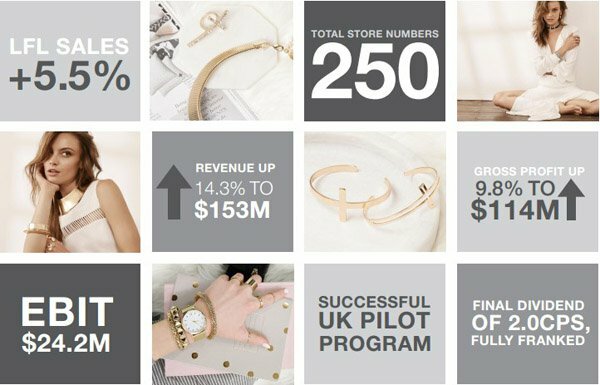 From an operational perspective LOV appears to be in good shape having opened 43 new stores in fiscal 2016, bringing its store numbers to 250 as at June 30. The company’s main areas of representation are Australia (144 stores) and South Africa (36 stores). However, in November 2015 the company embarked on a pilot program to determine the feasibility of entering the UK market. Management said the outcome of this program was that stores have traded within the key performance indicators and the decision has been taken to proceed with the rollout, and additional stores are expected to be trading by Christmas. The company is also targeting the Asian market with 33 stores already established in Singapore and Malaysia. Furthermore, the company opened its first store in Vietnam in July. While management didn’t provide profit guidance for fiscal 2017, the qualitative projections were sound with the group expecting like-for-like sales growth of between 3% and 5%, and gross margins being maintained at circa 75%. In summing up his take on the result Haddad said, “We believe LOV will continue to rerate upon successful trading execution through the key second quarter 2017 period, and as momentum in the UK builds”.